Distance records are regarded as being the most difficult of all ballooning records as it does entail flying in winds that are faster than those that would be chosen for a balloon flight. Add to that the delicate nature of a small balloon with a paraglider harness offering little physical protection, and the risks involved increase significantly. 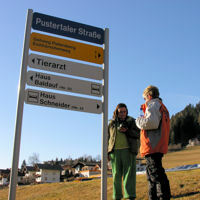 The forecast winds in the Dobbiaco valley, in the alpine region of northern Italy, were from the west. A launch site was chosen in Monguelfo as it offered good protection from the wind with mountain ranges to the immediate north and south. The expectation was for Pauline to fly along the valley past Villabassa, Dobbiaco and San Candido with a landing around the Austrian border. 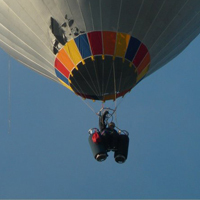 The balloon was rigged up and Pauline was sat into her harness with one fuel cylinder at her side. The recording barograph and GPS systems were fitted and the FAI-appointed observer took notes of the exact time and location where Pauline took to the air. The first part of the flight was fairly uneventful with Pauline reporting her position, direction and speed while her flight crew and observer followed by road, keeping her in visible contact throughout the whole flight. As the region is very hilly, Pauline was forced to climb higher to ensure that she remained clear of any low-level turbulence around some of the hills that she overflew. 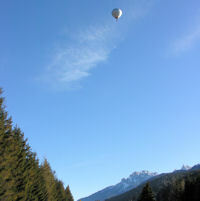 Pauline flew overhead the towns of Villabassa and Dobbiaco before climbing to clear hills before reaching San Candido. The balloon that Pauline was flying was designed specifically to be as lightweight as possible. With this in mind, the burner of the balloon was minimalistic. Modern day burners have piezo ignition systems that provide a spark and keep the pilot light, that runs continuously, alight. Pauline's burner had no such system and the only source of ignition available to her was a welder's striker, used for igniting oxy-acetylene torches. Whilst crossing the hill into San Candido, the striker, that was tied to her harness, came away and fell to the ground leaving Pauline with no means of re-lighting the pilot light should it go out. 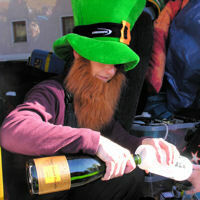 Celebrating in true Irish style! Within minutes of losing the striker, the conditions cruelly deteriorated with significant turbulence shaking the balloon like a pendulum and causing it to deform. This, in turn, caused heat to be lost from the balloon forcing a rapid descent. The turbulent air and pendulum also meant that the burner flame was not going upwards into the mouth of the balloon and was seen from the ground to be going sideways, causing a number of the lower panels to be burnt. Pauline experienced a snow-shower of tiny fabric particles. Throughout this very unpleasant experience, the pilot light was spluttering causing unburned propane to drip onto the pilot. Pauline had no other choice than to let the balloon continue to cool and descend below the turbulent layer. She then landed in fast conditions, dragging for 50 metres on a 50 degree slope above the village of Sillian in Austria, suffering little more than light bruising. Pauline confirmed, after the flight, that she was terrified during this ordeal. Despite this, it had not put her off and she attempted additional records during the next two weeks in Chateau d'Oex, Switzerland, a town made famous as the launch venue for the first successful round the world balloon flight by Brian Jones and Bertrand Piccard in 1999.